We're now wrapping up our live coverage of the landmark meeting between US President Donald Trump and Russian President Vladimir Putin, who have been holding their first official talks in Helsinki, Finland. You can find all the latest updates on our main story here. The daughter of US Senator and former presidential candidate John McCain tweeted that she was "horrified" after the summit. "The meeting between the Russian and US presidents was long anticipated. It plays a huge role not just for establishing normal political dialogue, normal bilateral relations, this meeting has huge significance for the world, for global stability." Ms Matvienko also said the world would "calm down somewhat" now that Russia and America had started a dialogue. "It's a very good sign." Former secret service agent Dan Bongino has said on Fox News that "nobody's been stronger on Putin than Trump". Mr Bongino was talking with reference to the death of Russian mercenaries in Syria, saying the American military "had the Russians scrambling". "I don't think Putin expected Trump to respond that way," he said. "That was not an insignificant incident over there." He also said Mr Trump's comments about Russian gas pipelines was another example of the US president confronting the Russians. Mr Trump's new World Cup football, which Mr Putin handed him earlier, has apparently made its way through security scans. Earlier, Senator Lindsey Graham's tweet about the football's potential security threat garnered thousands of likes. On Sunday, National Security Adviser John Bolton told ABC news that the administration was concerned about Russian interference. But Mr Trump seemed to have a different opinion on Monday. Donald Trump's apparent siding with Russia over his own intelligence agencies is causing quite the stir. More details have emerged about the reporter - who other journalists in the room said had placards about he wanted to hold up - who was forcefully ejected from the press conference before the presidents arrived. "Sam Husseini, communications director of the Institute for Public Accuracy, received press accreditation from The Nation to cover the summit. "At a time when this administration consistently denigrates the media, we’re troubled by reports that he was forcibly removed from the press conference before the two leaders began to take questions. "This is a developing situation that we will be following closely," it added. It has long been rumoured the Russian government has some sort of compromising material concerning Donald Trump. So one reporter decided to take the bull by the horns and ask Vladimir Putin directly. And, to use the words of our White House reporter Tara McKelvey, "guess what: Putin says he doesn't have anything". He also told reporters he did not even know Mr Trump, then a businessman, was in the country. President Donald Trump was asked outright if he believed his own intelligence agencies or the Russian president when it came to the allegations of meddling in the elections - and if he would denounce Russia with "the world watching". Mr Trump dodged the question. “People came to me, [national intelligence director] Dan Coates came to me and some others, they said they think it’s Russia," Mr Trump said. Vladimir Putin has just handed a football to Donald Trump. "Now the ball is in your court," he joked. Mr Trump says he will give it to his youngest son. Vladimir Putin has gone into more detail about the alleged Russian meddling in the 2016 election, initially challenging a reporter to name a “single fact” that could prove any alleged collusion. “This is nonsense,” he said. He also pointed to an agreement dating back to 1999, which meant people could be extradited between the countries. "He [Robert Mueller] can use this treaty," he said. "Send in an official request to us, then we would interrogate these individuals who he believes are privy to some crimes. Our enforcement officers are able to do this." Asked about this morning’s tweets in which he said American “foolishness and stupidity” was behind the low point in Russian-US relations, Mr Trump said he did hold Russia accountable – in part. “I think the United States has been foolish, we’ve all been foolish,” he said. And reiterating his frustrations with the probe into alleged meddling, he announced there was “no collusion” and spoke about how he defeated Hillary Clinton in the 2016 election. "The probe is a disaster for our country, it has kept us separated. There was no collusion. "It was a clean campaign - I beat Hillary Clinton easily. We won that race and it is a shame there could even be a little bit of a cloud over us," he said. Donald Trump also touched on the allegation Russia interfered in the 2016 US election, which he won. He said he and Vladimir Putin had discussed it at length, and he had brought it up because "I felt this was a message best delivered in person, spent a great deal of time talking about it". However, he gave no details of how Mr Putin responded. 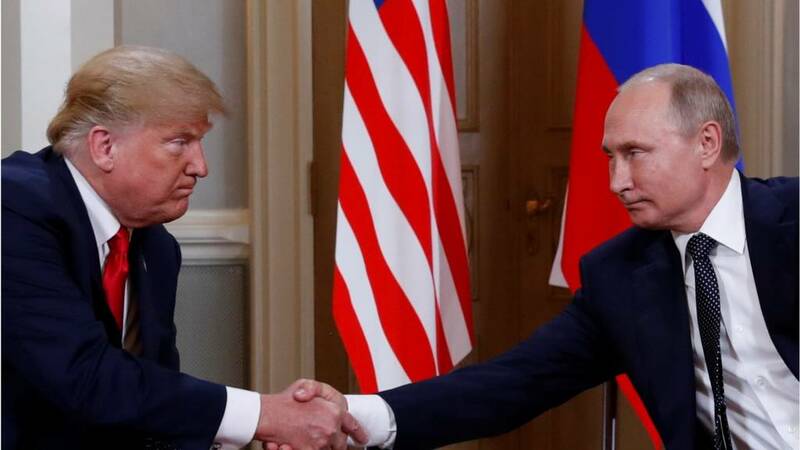 Donald Trump went on the defensive over his decision to hold a meeting with Vladimir Putin, which has been widely criticised. "Even during the tensions of the Cold War... the US and Russia were able to maintain a strong dialogue," he told reporters. "But our relation has never been worse than it is now. However that changed as of about four hours ago." He added that "nothing would be easier politically than to refuse to engage" which would "appease partisan critics, the media" and the opposition." But he said, he would rather take the risk. "As president, I will always put what is best for America and what is best for American people," Mr Trump said. The "scourge of radical Islamic terrorism" was also discussed at the meeting, Mr Trump says. They agreed to work together to deal with the issue, he said. Mr Trump begins talking, calling today's talks “direct, open, deeply productive dialogue”. "The disagreements between our two countries are well known, and President Putin and I discussed them at length today," he said. Russian foreign minister Sergei Lavrov is upbeat about the Putin-Trump talks. "Fantastic, better than super," he said. They are pleased with the outcome of their first "full-scale meeting". However, "clearly there are some challenges left," he said.